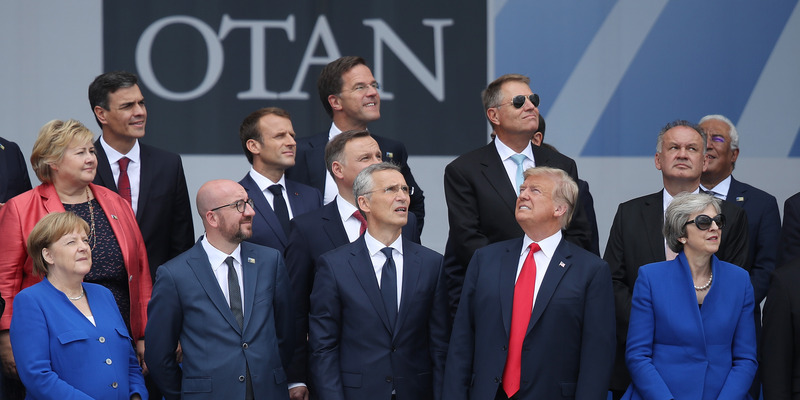 Sean Gallup/Getty ImagessPresident Donald Trump with other leaders at the 2018 NATO Summit in Brussels, July 11, 2018. European members of the EU and NATO are looking for ways to bolster their own defence industries. Part of that interest stems from frustration and uncertainty about President Donald Trump. But part of it is related to European countries’ own defence prerogatives and frustration with other US policies. President Donald Trump’s broadsides against NATO are stoking resentment among the US’s European allies. Trump’s frequent criticisms of the alliance have been focused on the 2%-of-GDP defence-spending level that the bloc in 2014 agreed to “move toward” by 2024. The US president’s apparent frustration with that movement came to the fore during the NATO summit in July, when he reportedly told fellow NATO leaders that their countries needed to reach that spending level by 2019 “or the United States would go it alone” – though he did not directly threaten to leave the alliance. For countries that have long been assured of US assistance, Trump’s pressure and newfound doubts about US security guarantees that he has inspired add to their growing focus on expanding domestic defence capacity. In June, Jorge Domecq, the Spanish chief of the European Defence Agency, said European countries needed to move toward “strategic autonomy” by reducing their reliance on US-made weaponry. “I don’t think Trump would do anything, knowingly, that would hurt US arms sales,” said Jim Townsend, an adjunct senior fellow in the Transatlantic Security Program at the Center for a New American Security, pointing to the administration’s efforts to boost US arms exports. But Trump’s comments and policies that make the US commitment to NATO look uncertain give Europeans “the willies in terms of … buying US weaponry, because if all of a sudden we disengage does that mean it’d be harder to get spares?” said Townsend, who was US deputy assistant secretary of defence for European and NATO policy for eight years. US Army photo by Pfc. 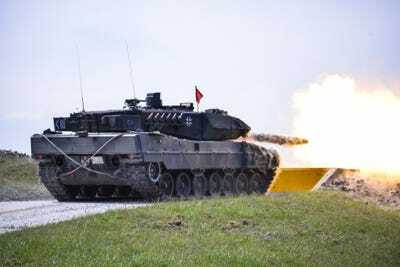 Javon SpenceGerman soldiers in a Leopard tank fire at a target at the Grafenwoehr Training Area in Germany, May 11, 2016. Trump’s actions have helped build “a narrative in Europe where European leadership says, ‘We do need to spend more money on defence. We do need to build up our military capability because we feel we can’t depend on the United States,'” said Townsend, who also worked in foreign military sales at the US Defence Security Cooperation Agency. “So what happens then is that this builds this narrative that we’re going to buy European and therefore we’re going to need to build up the European defence industry, and the European Union can help do this” through institutions like the Permanent Structured Cooperation framework, which aims to deepen defence cooperation. NATO members have already increased defence spending. Defence expenditures as a percentage of GDP rose again in 2017 after 2016 saw the first such increase since 2009, according to NATO. After the July summit, Trump said NATO members had pledged additional increases, though other countries disputed that. In Western Europe, 2016 was the second consecutive year of military-expenditure increases, rising 2.6%, the Stockholm International Peace Research Institute said in mid-2017. Spending in Central Europe rose 2.4% that year. European defence initiatives have also cropped up more frequently, particularly after Russia’s annexation of Crimea in 2014. In mid-2017, the EU launched the European Defence Fund, a multibillion-euro program to encourage defence procurement. That was the first time the bloc used money from its budget for buying military gear, but members have been cooperating on defence projects for some time, even if national interests and political machinations have made joint undertakings more difficult. Support for more military spending is seen as stretching across Europe’s political spectrum. Other decisions by the US have led some in Europe to believe they need a non-US avenue through which to develop their defence industries. In France – one of the biggest arms exporters in the world – frustration has grown over the US withholding clearance for the sale of the Scalp cruise missile, which includes US-made components. The US-made parts are critical for the long-range weapon, and Washington’s decision not to authorise the transfer upended a deal for France to sell Rafale fighter jets to Egypt. The ability to block the sale came through the International Traffic in Arms Regulations, an export-control regulation overseen by the US government. In response, French officials have said they’re looking for a way around ITAR – and to gain more autonomy. “It is true that we depend on this (US International Traffic in Arms Regulations) mechanism: We are at the mercy of the Americans when our equipment is concerned,” French Armed Forces Minister Florence Parly told legislators in early July,according to Defence News. “Those kind of things – the F-35 to Turkey, the US under ITAR, the US saying to the French, ‘Sorry, we’re not going to let you export to Egypt,’ and then all this stuff with Trump – all of that is doing nothing but increasing the motivation within Europe to build up their own military capabilities, based on their own industries, and screw the US,” said Townsend, referring to a move by Congress that would withhold the transfer of F-35 fighter jets to Turkey.